Originally published under the title "The Middle East Studies Blind Spot." This article was commissioned by Campus Watch, a project of the Middle East Forum. Haj Amin Husseini (left) meets with SS-Reichsführer Heinrich Himmler, April 1943. Anti-Semitism, the hatred of the Jews as Jews, has a history in the Arab states and in Iran. It is blatant and obvious in the declarations of the government of Iran and in the public statements of Islamist organizations such as Hamas and Hezbollah. The link between Islamism and anti-Semitism has been a continuing theme of the Muslim Brotherhood in Egypt since the canonical writings of Hassan al-Banna, Haj Amin al-Husseini, and Sayyid Qutb from the 1930s to 1950s. The evidence of its presence is extensive in the files of the American and British diplomatic archives. It was a theme in the liberal and left-leaning journalism of the World War II era and in the scholarship of the postwar decades. Yet the discipline of Middle East Studies today, rather than building on this valuable scholarly legacy, shows too little interest in the topic. Or it finds anti-Semitism's origins in the existence and policies of Zionism and the state of Israel while neglecting the presence of such antagonism in the years before Israel's founding. In so doing, the current disinterest evinces the entry into the academy of aftereffects of the leftist ideological offensive against Israel and Zionism that achieved so much success at the United Nations from the 1960s to the 1980s and that culminated in the UN's "Zionism is racism" resolution of November 1975. In the last decades of the Cold War, the Arab states, the Palestine Liberation Organization, and the Soviet bloc placed the entire blame for the Israel-Arab-Palestinian conflict on Israel. As I am documenting in At War with Israel: East Germany and the West German Radical Left, 1967-1989, forthcoming with Cambridge University Press in spring 2016, these countries and organizations equated Israel with Nazi Germany and succeeded in preventing any public examination of the policy of expulsion and ethnic cleansing of the great majority of Jewish citizens of Israel that would have resulted from an implementation of the PLO's Charter of 1968. The flow of such ideas into the academy has created a regrettable blockage of research into the issue of anti-Semitism in an Arabic, Islamist and also Iranian context. Leading Arab political figures eagerly collaborated with the Nazis. 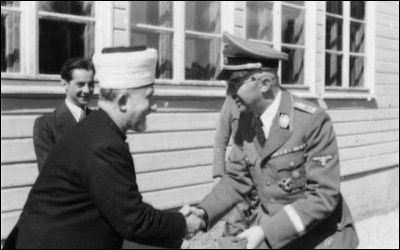 During World War II and in the immediate postwar decades, it was common knowledge that leading political figures from Arab countries, most famously the Grand Mufti of Jerusalem, Haj Amin al-Husseini, eagerly collaborated with the Nazi regime. The left-leaning press of the time, most notably the Manchester Guardian in Britain and The Nation magazine in the United States, documented his anti-Semitic speeches which were broadcast in Arabic by the Nazi regime in the Middle East. Officials of the U.S. State Department and the Office of Strategic Services were also aware of the enthusiasm for Husseini's collaboration with Hitler voiced by Hassan al-Banna, the leader of Egypt's Muslim Brotherhood. In 1963, Manfred Halpern, formerly in the State Department but then a professor at Princeton, published The Politics of Social Change in the Middle East and North Africa. Halpern then described the Muslim Brotherhood as a form of "neo-Islamic totalitarianism." In 1966, the Polish émigré historian Lukasz Hirszowicz's The Third Reich and the Arab East drew on files of the Nazi regime to document its efforts to seek support from Arabs based on shared antagonism to Britain and to Zionist plans for a Jewish state in Palestine. In 1986, in his Semites and Anti-Semites, the historian Bernard Lewis documented these lineages and noted their ideological aftereffects in succeeding decades. In the aftermath of the Iranian revolution of 1979 and then even more after the attacks of September 11, 2001, intellectuals and scholars in Europe, the United States, and Israel published a body of work that examined both the links between Nazism and Islamism and that explored the roots of Jew-hatred in the Islamist interpretation of Islam. In 2002, Paul Berman in Terror and Liberalism examined the mélange of modern totalitarian and Islamist forms of hatred of modernity and the Jews in the works of Sayyid Qutb. In the same year in Germany, Matthias Küntzel documented connections between Nazi propaganda during World War II, the ideas of an "anti-Jewish war" in the Muslim Brotherhood, and then in Al Qaeda. In 2007, Küntzel's work was published in English translation as Jihad and Jew-Hatred. In 2006, in Nazi Propaganda for the Arab World, I drew on German and American government archives to offer far more evidence about the cultural fusion between Nazi and Islamist themes in the Nazi regime's propaganda aimed at the Arab countries during World War II. That work included evidence about postwar influences in the Muslim Brotherhood and in Husseini and Qutb's words and deeds of the late 1940s and early 1950s. In 2009, Meir Litvak and Esther Webman of the University of Tel Aviv published From Empathy to Denial: Arab Responses to the Holocaust, a superb study of Arab public expressions of Holocaust denial and accusations that the state of Israel was comparable to Nazi Germany. In numerous essays and books, most importantly the 2010 work A Lethal Obsession: Antisemitism from Antiquity to the Global Jihad, Robert Wistrich, the long-serving director of the Vidal Sassoon International Center for the Study of Anti-Semitism, examined what he described as a shift of the global center of gravity of anti-Semitism from Europe to the Middle East and Iran. Also in 2010, Klaus Michael Mallmann and Martin Cupper's 2006 work on Nazi policy toward the Middle East was published in English translation as Nazi Palestine: Plans for the Extermination of the Jews of Palestine. Hatred of Jews and Judaism has played a central role in the Islamist ideological tradition. Some Middle East specialists have contributed to this body of work. In 2011, Bassam Tibi's Islamism and Islam examined Islamism as a distinctive twentieth century tradition that interpreted the religion of Islam to be inherently anti-Jewish, anti-democratic, and to offer legitimations for the use of terror. In 2014, Barry Rubin and Wolfgang Schwanitz, in Nazis, Islamists and the Making of the Modern Middle East, offered further archival support to the history of collaboration with Nazism and its consequences. Klaus Gensicke, Fouad Ajami, and the essays and novels by the Algerian writer Boualam Sansal have added to the canon of intellectual interventions and scholarship that examines hatred of the Jews and resulting hatred of Israel. These works, and others, offer abundant evidence that hatred of the Jews and Judaism has and continues to play a central role in the Islamist ideological tradition, in both its Sunni and Shia variations. It was and remains a cause and not only an effect of the conflict between Israel, the Arab states, and the Palestinian organizations. While it borrows from the conspiracy theories and racial stereotypes of its European predecessor, it also finds support in tendentious readings of various passages of the Koran and the Islamic commentaries about that work. For the above-mentioned authors, the relationship between Islam and anti-Semitism has the same logical structure as that between Christianity and anti-Semitism. They assume that as with Christianity, so with Islam a view sympathetic to Jews and Judaism was and is conceivable. However, like Christianity, Islam has been and is open to anti-Jewish interpretations made all the more lethal for their apparent divine legitimation. The above-mentioned scholarship asks that scrutiny of Islam and Islamism regarding "the Jewish question" be no more—but also no less—critical than has been the case with the extensive and ongoing scholarship on anti-Semitism in its European, Western, and Christian forms. Contrary to defensive reactions one sometimes hears from Middle East Studies scholars, none of these works generalize from particular authors or movements to all Muslims, all Arabs, or all Iranians. Rather, they carefully document the existence of anti-Jewish hatreds among some significant Arab political traditions. 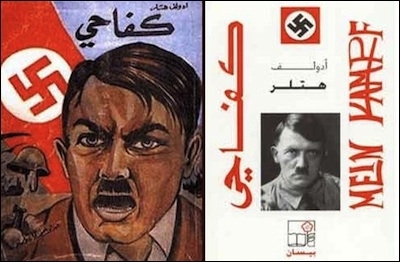 Hitler's Mein Kampf has been a bestseller for years in predominantly Muslim countries. The response of most practitioners of the current discipline of Middle East Studies to this body of scholarship has been at best grudging and at worst hostile and dismissive. One biographer of Husseini, Phillip Mattar, downplayed his ideological passions and presented him primarily as an opportunist who collaborated with the Nazis due to an anti-colonial alliance of convenience. Gilbert Achcar's 2010 work The Arabs and the Holocaust acknowledged Husseini's anti-Semitism but argued that he became an unimportant figure in the postwar decades (see my review in the New Republic). In 2010, at a conference in Tel Aviv on Arab responses to fascism, one participant opined that work on Haj Amin al-Husseini was unwelcome because its publication was bad for the Palestinian cause. Rejection of this scholarship is rarely so bald-faced, but the suspicion lurks that any discussion of anti-Semitism in an Arab and Islamic context serves "imperialist" or "Zionist" goals and thus must be dismissed. One standard answer has been to blame the state of Israel or the policies of the United States and earlier those of Britain and France for the prevalence of paranoid, anti-Jewish conspiracy theories. Another is to neglect the obvious such as the now well-known anti-Semitic themes of the Hamas Covenant of 1988 or the Holocaust denial that finds its way onto Arab and Iranian television and to various websites. Yet another form of avoidance is to insist that expressions of Islamism from the Muslim Brotherhood, Hamas, Hezbollah, Iran, and even the Islamic State have nothing to do with Islam or rather with interpretations of Islam. The argument that revelation of the truth will harm the political goals of some state, class, nation, or religion has often served to suppress the growth of knowledge. The suppression or postponement of knowledge about hatred of the Jews and Judaism in modern Arab and Islamist politics damages the prospects for a compromise peace with the Jewish state in the Middle East and lends legitimacy to terrorism directed against it. Yet the conspiracy theories of anti-Semitism also harm their advocates. By blaming all social, political, economic, and cultural problems on the Jews or the Zionists they make it impossible for anti-Semites to understand the real causes of the problems of their own societies. They foster irresponsibility and thus failure. The greatest irony about Middle East Studies and the Jewish question is that avoidance of facts about the affinities between Islamism and Nazism—with the European extreme right—has become a leftist academic signal of anti-colonial militancy. Rarely if ever has avoidance of research on the history of anti-Semitism found a more effective banner than that of the slogans of leftist anti-racism and anti-Zionism. Yet perhaps out of the chaos, violence, death, terror, and destruction engulfing the Arab Middle East today there will emerge a young generation of intellectuals and scholars for whom the above-mentioned scholarship will prove important as they realize that the Jews, Zionism, and Israel were not and are not the "problem" that is preventing their societies from achieving political stability and economic success. If so, perhaps these young scholars, disillusioned with the era of Islamist fanaticism, will be able to contribute to a much needed, yet now blocked, scholarly advance on the Jewish question within the Arabic and Islamic context. Jeffrey Herf, a professor of History at the University of Maryland—College Park, is a fellow at the Middle East Forum.